It’s canning season here on the Farm and you know what that means. It means my kitchen is in an uproar and I’m looking for anything that means easy cleaning! Right now I’m knee deep in cherries so I am making sticky messes all over the place. 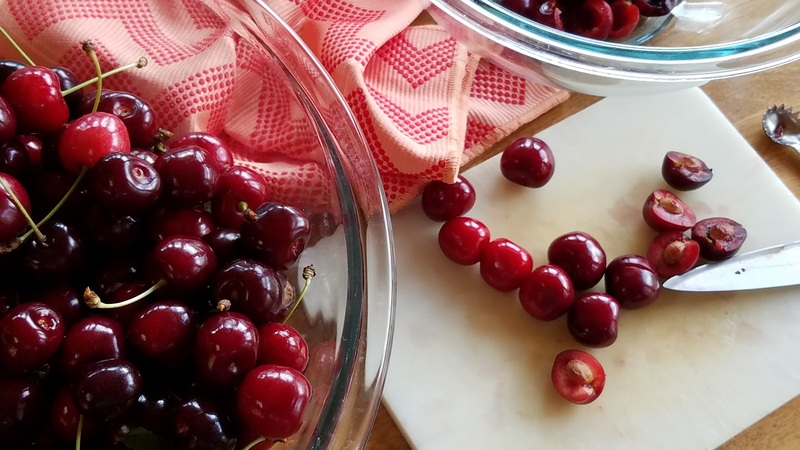 I love cherry season and I am very fortunate – my neighbor has an orchard and she lets me pick cherries to my heart’s content for cooking, baking, freezing and for jam. 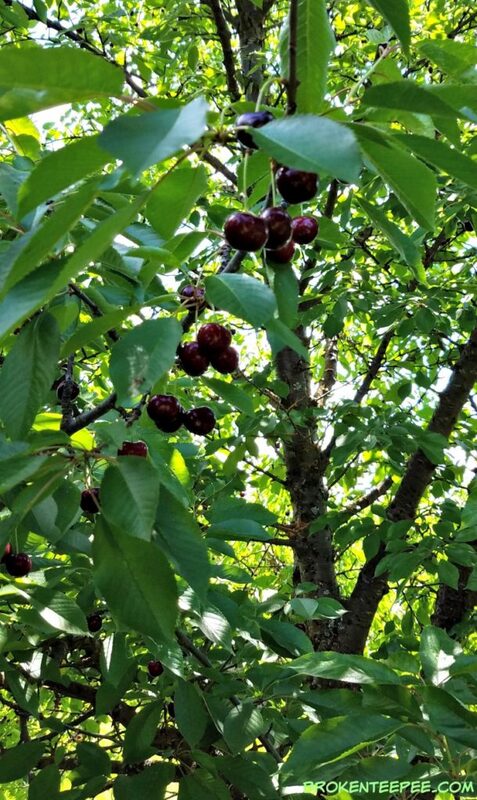 I visited her orchard earlier this week and the trees were chock full of beautiful bing cherries (she has pie cherries too but I will go back for them later.) After an hour of picking I ended up with 16 1/2 pounds of delicious fruits. It took me longer to pit them after I got them back to the house! I actually find it relaxing to sit and pit the cherries, truth be told, but it does make a bit of a sticky mess. 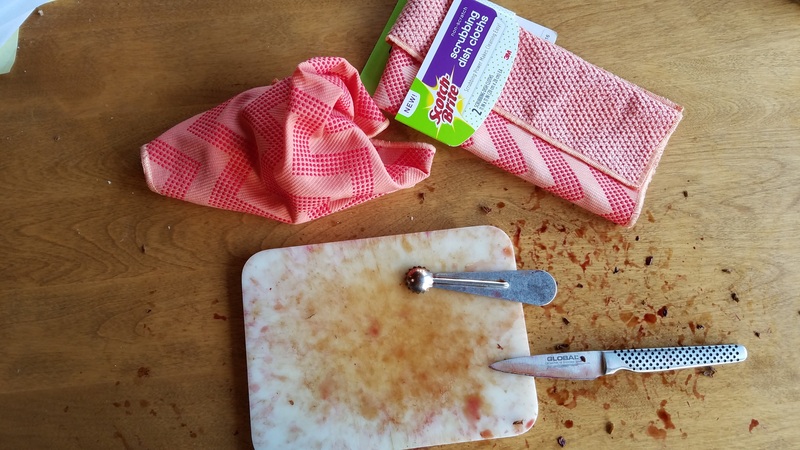 That is why I was glad to learn of the new Scotch-Brite® Scrubbing Dish Cloth. It’s really cool; on one side it’s a premium weave cloth, on the other side are spiffy scrubbers to help with those stubborn bits that always seem to get the better of me. You know the kind I mean, I always end up reaching for a butter knife if my fingernail can’t loosen them. Now with the new Scotch-Brite Scrubbing Dish Cloth I have everything I need in one cloth. The cloths are reusable, machine washable and available at Walmart in three colors; coral, navy and tan. Trust me, there is no way you can pit 16 1/2 pounds of cherries and not make a sticky mess. 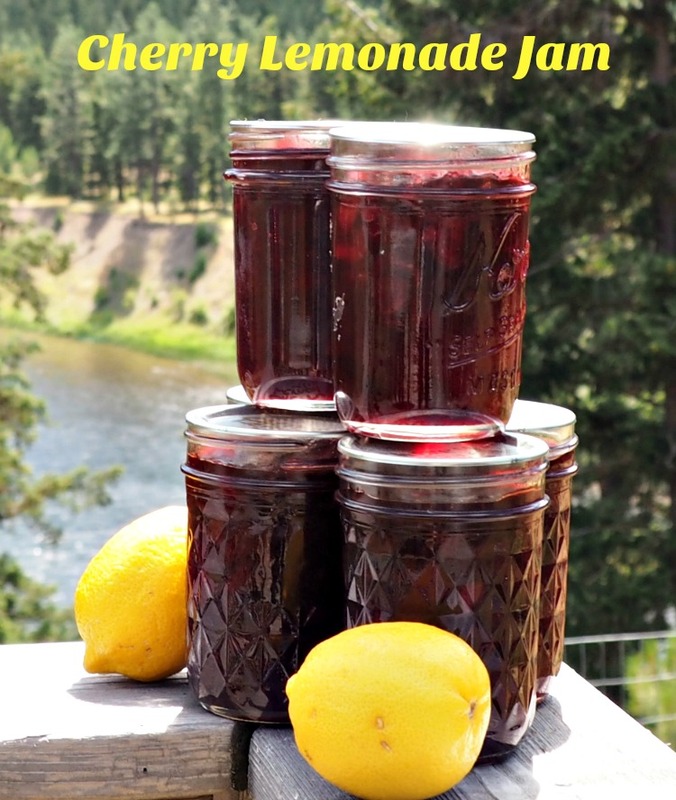 But I had much more mess ahead of me as I tried a new recipe for jam – Cherry Lemonade. I love cherry and lemon together so I thought I’d experiment. Make sure your jars and canner are ready before you make your jam. There is nothing worse than having your jam be ready for processing and realizing that your canner is full of cold water. Gather all of the ingredients for your jam and have them ready to go. Everything comes together quickly when cooking the fruit and you don’t want to be scrambling for something you need. When you need multiple cups of chopped fruits for a jam recipe it’s easy to lose track of how many you have added to the pot or bowl. I’ve learned to set aside a piece of fruit or a pit or something for each cup as I add it to the pot. That way if I lose count or am distracted I just have to look at my little pile and I’ll know where I am. Boiling sugar is HOT. Be careful when ladling the cooked jam into the jars. Learn from my bad experience. Take 1/4 cup of the total sugar and mix it with the pectin. Have your canner and jars prepared. Add the cherries and the pectin mixture and the butter to a large, heavy bottomed pot over medium high heat. Heat, stirring constantly until the mixture comes to a rolling boil. Add the remaining sugar and stir until sugar is dissolved. Stir until the mixture comes to a rolling boil. Boil for one minute and then remove from the heat. Ladle hot jam into hot half pint jars leaving 1/2″ headspace. Add the jars to hot water in a water bath canner and process according to your elevation. Below 3,000 feet process for 10 minutes, above 3,000 feet process for 15 minutes. Turn off the heat and let the jars sit in the water for 5 minutes. Remove the jars from the canner and let sit over night to set. *I’ve had a lot of people ask about the lemon powder. It’s basically dehydrated, powdered lemon juice. (It does have a small amount of maltodextrin) The flavor is very potent. Using it adds the strong lemon taste I want without the impact that too much lemon juice which would have impacted the set of the jam. I bought mine at King Arthur Flour but it is also easily found at Amazon.com (link below.) I also suspect that the larger grocery stores might carry it. You don’t want lemonade mix as that carries sugars and other ingredients. Look at That Easy Cleaning! The only thing that changes is the color of said mess. Sometimes it’s blue, sometimes it’s red and sometimes it’s peach. The one thing that doesn’t change – it’s always stuck on. 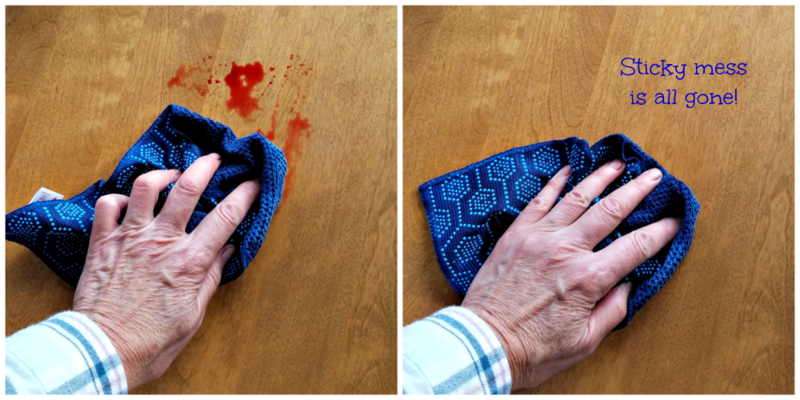 I’ve found that the NEW Scotch-Brite Scrubbing Dish Cloth is the perfect thing to use to clean the mess. I made a little video so you can see it in action. 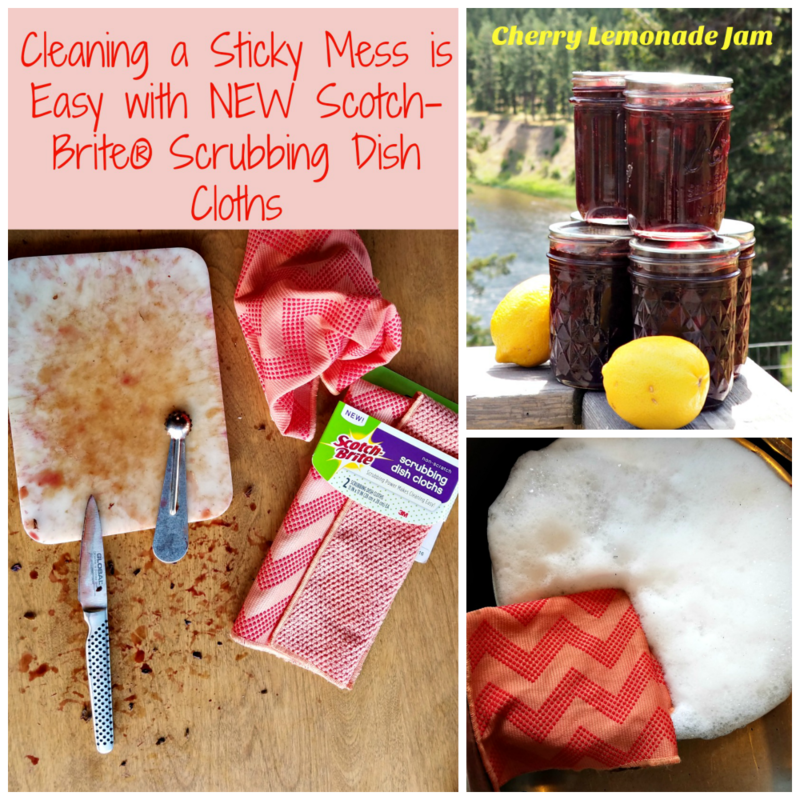 The Scotch-Brite Scrubbing Dish Cloth helped me clean the sticky jam mess I made. Pretty impressive, right? 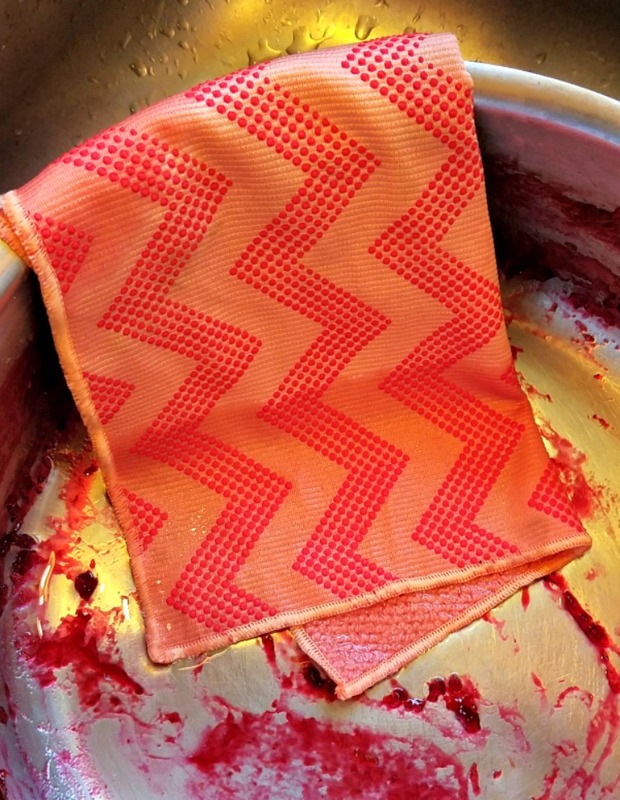 Sometimes though, even a super duper cloth needs a friend so I’ve got a tutorial below on how to make a simple Homemade Lemon Cleaning Solution to pair with your new Scotch-Brite Scrubbing Dish Cloth. It uses the lemons from the jam recipe! Nothing goes to waste on the Farm. 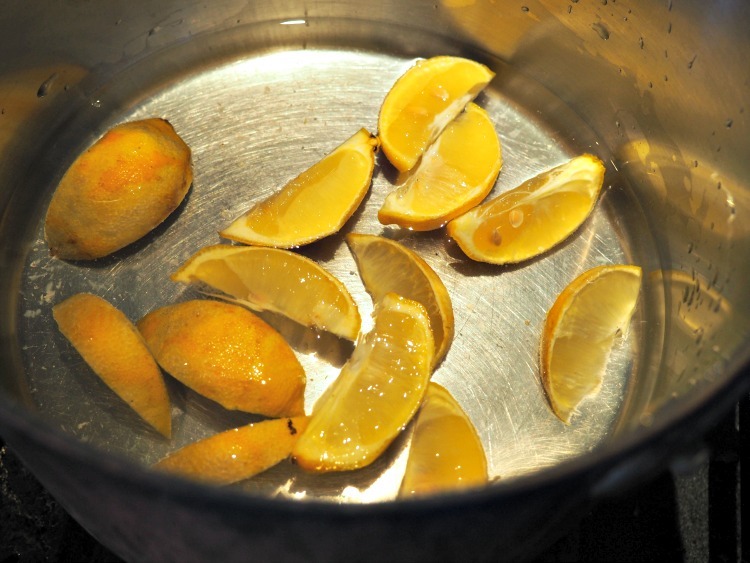 Heat the cut lemons in the water, just to a boil. Remove from heat and set aside to let cool. 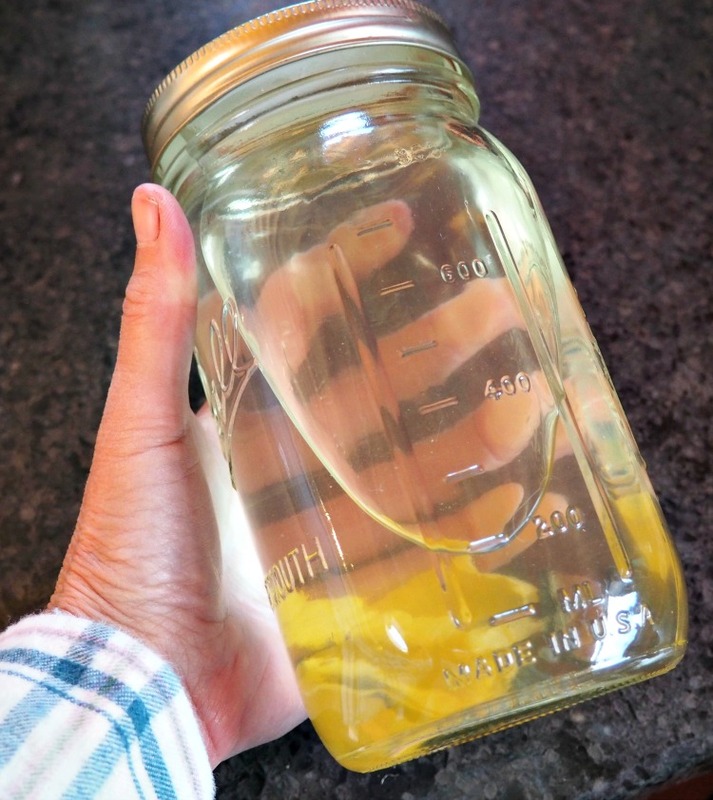 Strain the liquid through cheesecloth into a mason jar or spray bottle. Add the peel of one lemon. See? Simple and very useful. AND it smells really good. I use it straight from the mason jar for easy cleaning. I dip a little out and wipe down my kitchen counters. 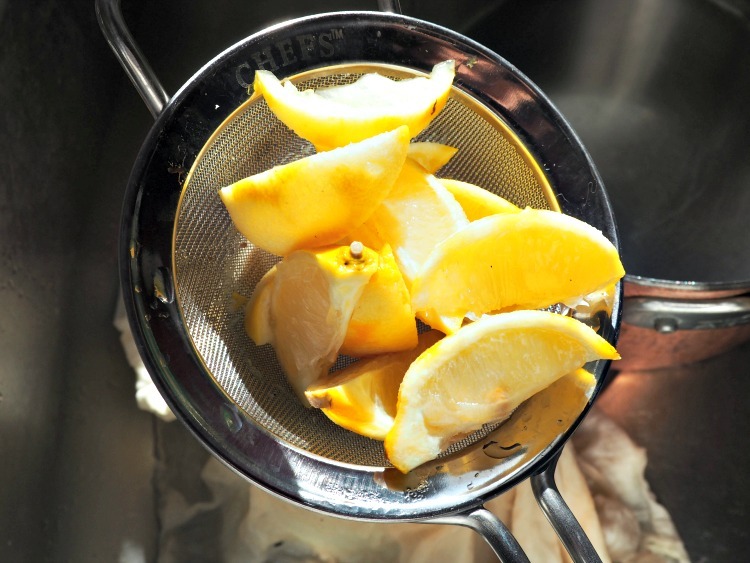 The lemon is the predominate smell so don’t worry that your kitchen will smell like a salad. I am very happy I have the new Scotch-Brite Scrubbing Dish Cloth. I found it on my last trip to Missoula when I popped into the Walmart. 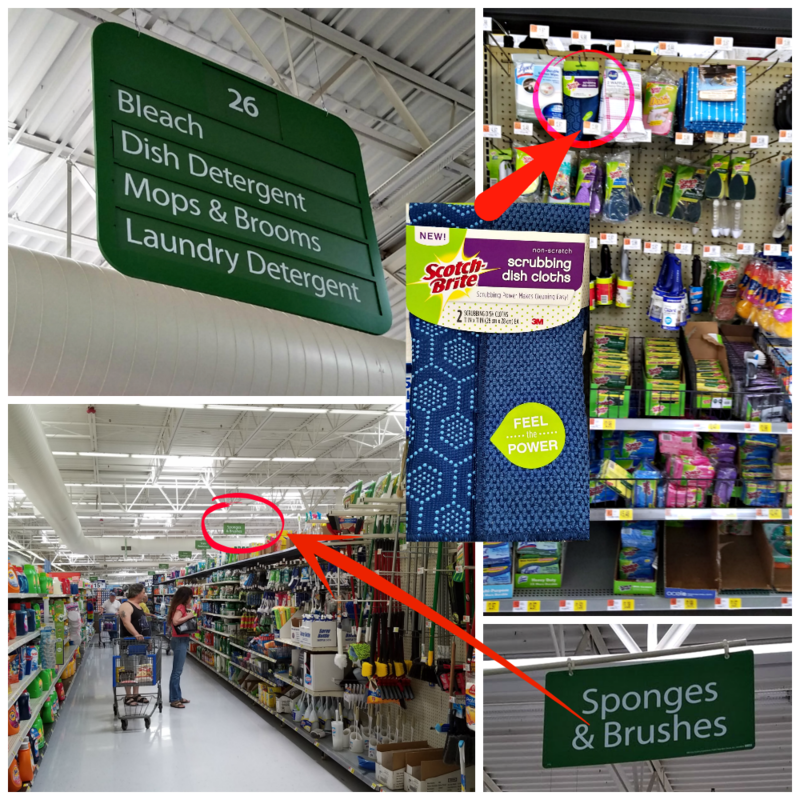 They are in the cleaning aisle with the sponges and brushes. 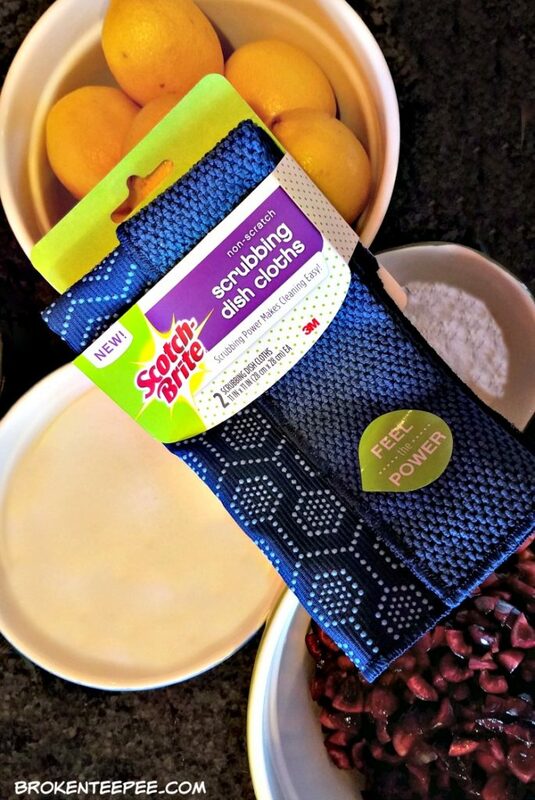 A package gives you two Scotch-Brite Scrubbing Dish Cloths so you can have one in the wash while you are using one. 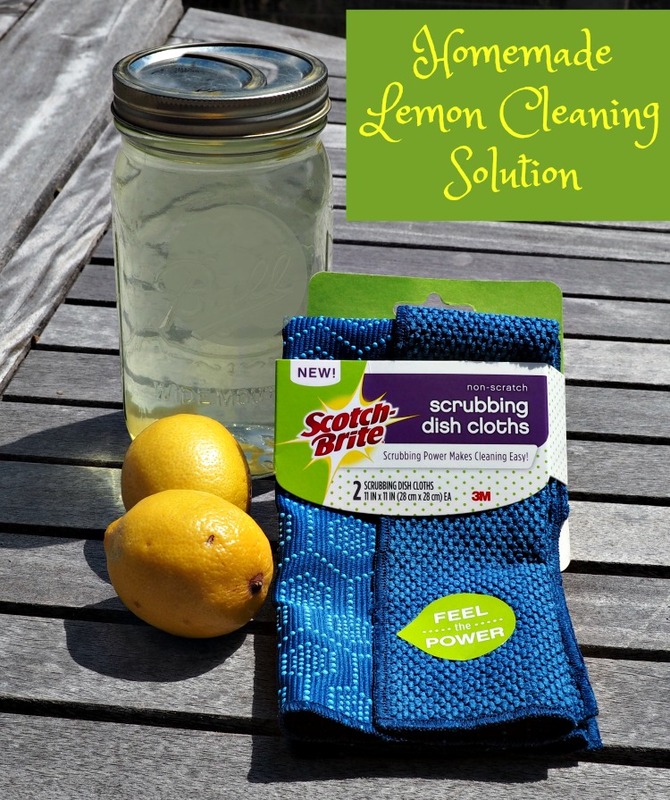 OK kitchen here I come – I have my Scotch-Brite Scrubbing Dish Cloth and my homemade Lemon Cleaning Solution. 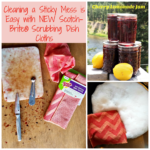 I can make jam all summer long with no worries about how I’m going to clean up my sticky messes.